The concept of nature in Western philosophy and culture identifies everything that is not created by human beings as nature. Within nature, a further distinction is made between ?abiotic? and ?biotic? nature. This perspective is problematical because on the one hand it is saturated with a certain arrogance, and on the other hand it runs counter to the logic of evolution. Furthermore, it perpetuates a structural distinction that goes back to Scholasticism between ?natura naturans? and ?natura naturata?. According to this distinction, we are deemed to be a part of ?created nature? and thus separate from ?creating nature?. The assumption on which this narrative is based does not share this classification.If the human being is one outcome of evolution, how can the results of his action then not be nature?Nature is not an antonym of culture; rather, culture is a variation that nature has allowed to this day through our existence. 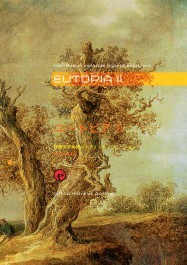 Eutopia II is based on the ontological claim that everything that is is one indivisible nature. This avowal of naturalism thus opens every possible hybridization, transformation and mutation of natural systems, that is, of all systems. At the core of this publication is a longing for narration and imagination, and by the same token the wish for liberation from the "terror of understanding" within architecture.The obsession with explicability and the quest for meaning follows an increasingly one-dimensional functionalization of the interpretation of architecture. This book opposes this lure of reality. The result is an architectural-spatial narration, a narrative fiction that does not strive to generate truth or to accommodate the imperative of consciousness.Seekers are always also travellers. Eutopia II is a place that receives travellers, that answers no questions, that leaves fictitious situations as they are and that is more apt to generate questions than to answer questions that were brought along. Story: Eutopia?s creatures are travellers. Hybrids in time, travellers in space. Without a destination and without a recognizable purpose. It remains uncertain whether they generate space, whether they are objects, living beings, machines, animals or animate architecture. They live invisibly among us, and there are only few who have had the good fortune to recognize them. Only when they wish and only in nebulous environments are they visible for brief moments.This little book recounts these sightings and the strange experiences that these people have made. Eutopia is not an alternative to reality, it is no refuge from the now or from the conscious self. It is an outing or a door. One door before perhaps ten thousand more doors that shall follow it.